There is no denying that social media is the best way to approach target customers and raise brand awareness in China, as the country has an extraordinarily high mobile device penetration rate. With new social media products and programmes constantly appearing, 2017 witnessed countless innovative and enlightening social media marketing ideas and events in China. It’s something that WGSN Insight report on heavily, from Social Media Case Study of McDonald’s China to the influencers making campaigns happen in China: Top Fashion Influencers 2017 . Author and marketing expert Ashley Galina Dudarenok, author of “Unlocking the World’s Largest E-Market: A Guide to Selling on Chinese Social Media” weighs in with four of the most interesting campaigns in China last year, helping us to take the pulse of digital marketing trends in 2018. At the end of 2017, a series of ‘co-branding’ cosmetic collections, involving the likes of Chanel, YSL and Tom Ford and the Beijing Palace Museum, became the most heated topic on Weibo. In fact, it was not an official collaboration but rather just a homemade edit – a girl playing around by layering traditional royal Chinese patterns, relating to the Palace Museum, onto her luxury cosmetics. She posted the results on Weibo, and the images went viral. More began to make their own personalized cosmetic packages, and the event eventually evolved into a UGC (user generated content) campaign. It was a case of ‘every brand wins’, in regards to brand awareness. The Palace Museum is still the biggest winner, as its sales rocketed and reached 1 billion RMB. Take-home message: Chinese audience favor fashionable products as well as traditional culture. Articulating Chinese culture in a modern way is definitely a trend for 2018. More essential question for brands to think about is how to take initiative and adopt Chinese elements properly without distracting customer’s attention from the product itself. Baiqueling released a lengthy nostalgia poster on WeChat and Weibo in celebration of Mother’s day about a female spy in 1931 using Baiqueling products to ‘fight time’. The poster received more than 30 million on WeChat and more than 100 million exposure on the internet in total thanks to its storyline and imagery. However, to everyone’s surprise, the purchase rate was astonishingly low, less than 0.008%. This was a controversial campaign, as it was example of remarkable social communication yet failed in its objective. Take-home message: Nowadays, audience crave a complete storyline- and it needs to be substantial or sentimental if it’s going to go viral. However, high page views no longer guarantee a high purchase rate. It’s time for companies to figure out whether their priority lies with brand awareness or product sales before deciding to promote on which social media. On Thanksgiving, 999, a Chinese medicine brand, released an advertising video called “Somebody Loves You In Secret”, which reached more than 150 million views on the internet and 100 million reposts on WeChat Moment and Weibo in total. It told five individual stories of people going through difficult times, only to pull through thanks to chance encounters with strangers. It captured the prevailing social issue in modern day China- serious anxiety and loneliness amongst the working class. Take-home message: With tons of pressure from work and family, Chinese people often feel a strain on their mental health. As a result, campaigns addressing this are doing well- particularly if they deliver a positive note. A successful campaign should also create a space for the audience to release their feelings or join in the conversation. It’s beneficial for the audience and promotes the brand, too – although authenticity is key. Sympathy communication is never out of date and in-depth social insights will be a must 2018. During last year’s 12.12 Shopping Festival, Taobao launched its Short-video Impression Program, pledging to invest 10 billion into it. Taobao encourages its shoppers to produce high-quality 15-second long videos to introduce their goods and those with outstanding content will be put on the front page for broadcasting. Meanwhile, many influencers were invited to produce soft content videos. For example, Ms Yeah published her own talk show on Taobao, interviewing other influencers and recommending products to the audience. The serial reached 200 million video view on the internet and 100 million Weibo discussion. Take-home message: Short video is the future of social media marketing in China and content comes first. That’s why short video is transforming from UGC (User Generated Content) to PGC (Professional Generated Content). Brands should look to collaborate with influencers in 2018 for strong campaigns with plenty of reach. To sum up, there are three major trends we can learn from the 4 cases above. First, quality of content is top priority. Second, short video will be the most popular form in 2018. Third, strategic collaboration between brands are necessary and profitable. However, the social media marketing industry is ever-changing. The only thing that remains constant is that China will still be monopolized by social media marketing in 2018 and shall not be replaced in a long time, since the generation of 1990s begins to dominate the purchase group of China society. 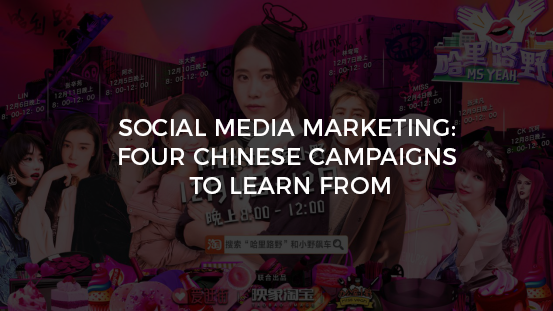 Disclaimer: This article <Social media marketing: Four Chinese campaigns to learn from> was originally published in WGSN.